Shiner doesn't require too much grooming, and is low maintenance in terms of her coat and fur. Mostly, we just deal with itchy skin issues but that's another story. For the most part, Shiner's grooming consists of an occasional bath here and there. Maybe more baths if she's itchy and her skin is flaring up. I admit that I don't really brush Shiner that often. After trying out the FURminator Dual Brush for Dogs that Chewy.com sent to us, I think I'll change that habit. This brush has two sides - a pin brush and a bristle brush. The side with the pin brush is designed for dogs with longer coats. Shiner definitely doesn't have long fur, but I think she actually likes it when I brush her with the pins better. It must feel good to her. The pins are designed to help remove mats, tangles, and loose fur. The other side of the FURminator Dual Brush for Dogs has nylon bristles. This side seems to have more function for Shiner's fur type. She enjoys being brushed with the nylon bristles as well, just not as much as the pins. The nylon bristles are designed to remove debris from dogs with shorter fur. For dogs with long fur, the bristles help finish off the coat and creates a natural shine for their fur. I think this brush would be awesome for multi-dog households who have multiple fur types. That way, you don't have to buy multiple brushes and try to keep up with them all. 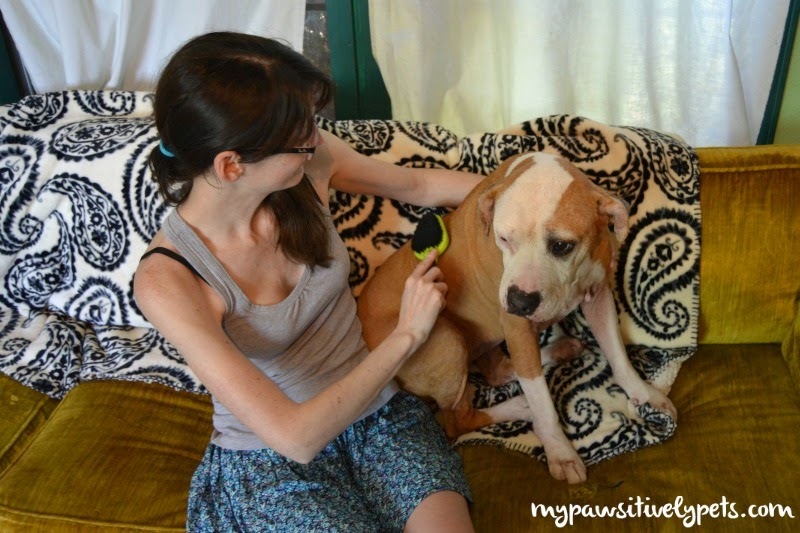 Shiner thoroughly enjoyed her visit to the "dog salon" with her new FURminator from Chewy.com. She anticipates more brushing with it in the weeks to come. 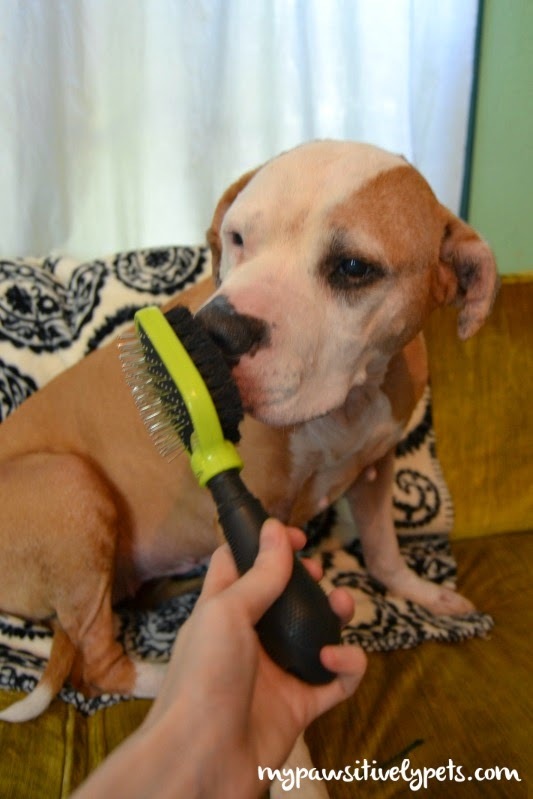 Besides the functionality of the brush and the need for regular grooming with your dog, I believe that brushing your dog can be a nice bonding experience. I feel like Shiner feels loved while I brush her. It's awesome! The FURminator Dual Brush for Dogs is on sale right now at Chewy.com for a great price. You can check it out here. Chewy.com is "where pet lovers shop". 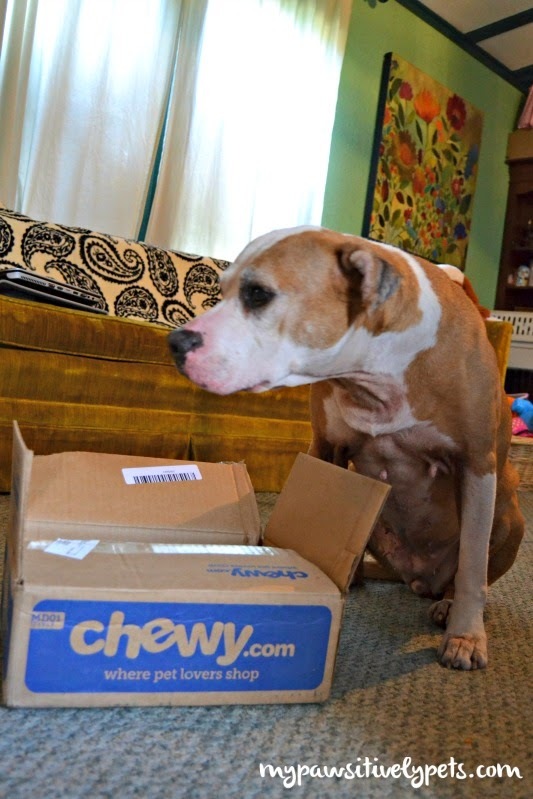 Normally, you might find us reviewing tasty treats from Chewy.com, but did you know they also sell other products for you pet? They carry over 300 brands of pet products - pet food and treats, grooming supplies, parasite control, toys, bowls, and so much more. They have excellent customer service and their packages always arrive to us quickly! Do you brush your dog regularly? What kind of fur do they have? We received a free Furminator Dual Brush for Dogs from Chewy.com in exchange for our honest opinion about the product. All thoughts expressed here are our own and honest! We don't get brushed that often either and we don't like the furminator. Have a tremendous Thursday. Haha! well I think Callie would agree with you Molly. She also does not seem to enjoy the furminator much. I just got that brush too! My dog has short sleek fur, but during spring and fall her haunches get super fluffy! Oh most definitely I brush my dogs often! I have to with 3 huskies! haha! 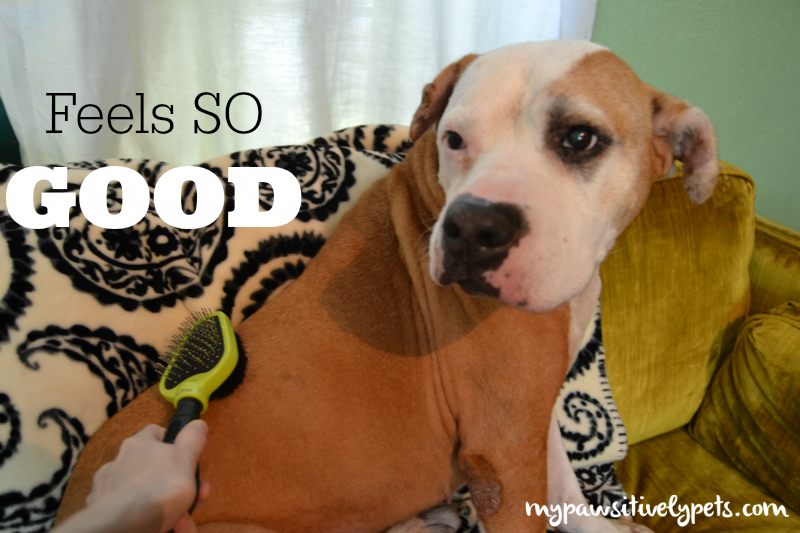 I love the furminator, use it daily but haven't tried this new one! It looks like a great brush! Chewy certainly has a lot of great things! Luna isn't a big fan of getting brushed. She tries to eat the brush, so I admit I probably don't brush her as much as I should. Well, I guess it's a good thing she has short fur :) Shiner seems to enjoy it! Rooney has really thick fur. I would LOVE to have a furminator! How nice that Shiner enjoys being brushed by the Furnimator. Annie likes being combed, and like Shiner, she obviously feels loved. Great review! We have furminators here and we all love them...except for Sascha! We have a furminator for cats and the mom doesn't use it on us very much. She needs to start. I use Furminator's Curry Comb for Bain. That dog loves to be brushed. You do look pretty wash and wear, Shiner! I have to use a stripping brush so this wouldn't work for me at all, but glad you like it. We used to have a brush similar to that and I did like the different options for different dogs. I'm using my brush on Jax. It's the perfect size for him and the soft bristle side is a great way to get him used to being brushed. Here in Doodleville everybody's got to get used to daily grooming. I take Nelly and Sophie to the groomer, when they use the furminator on Sophie, she looks fantastic. I rarely brush Theo, but our cat is a different story. He has neurological problems and doesn't groom himself very well, so we have to brush him regularly or he has awful mats.